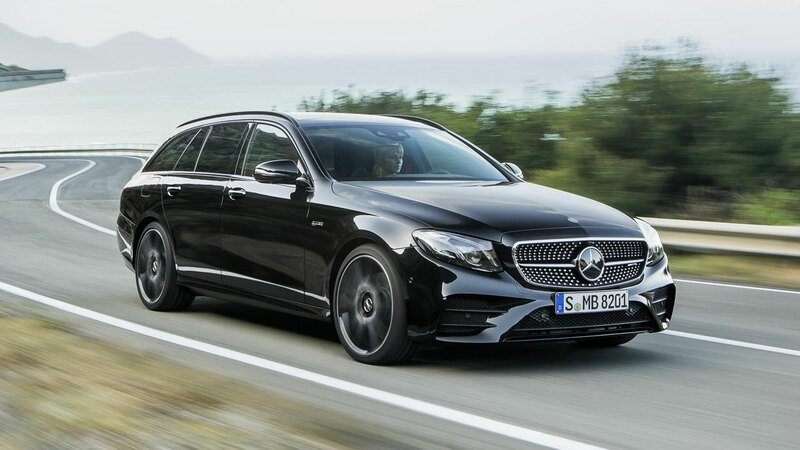 Three new engines have been added to the E-Class Estate range, which now starts at £36,735 for the E 200 d SE. The E 350 d SE is priced from £47,255, while the Mercedes-AMG E 43 costs £58,290. The existing E 220 d Estate starts from £38,230. The 200 d features the latest 2.0-litre diesel engine with an output of 150 hp and CO2 emissions of just 109 g/km. It delivers 65.7 mpg on the combined cycle. The 3.0-litre V6 E 350 d produces 258 hp while delivering up to 48.7 mpg and emitting 140 g/km of CO2. 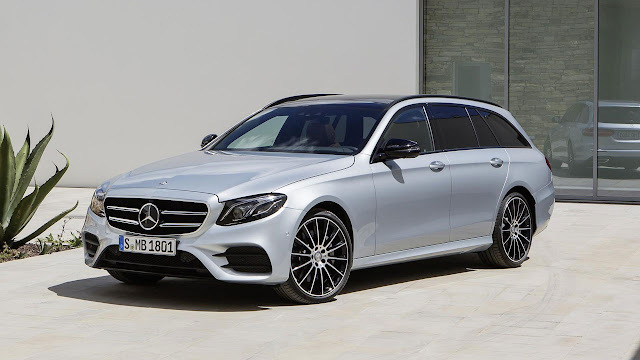 The Mercedes-AMG E 43 4MATIC Estate features a bi-turbo 3.0-litre V6 petrol engine which generates 401 hp – enabling it to reach 62 mph from standstill in 4.7 seconds. All E-Class engines come as standard with a 9G-TRONIC automatic transmission (with shorter shift times for the E 43). Standard specification on the E-Class Estate mirrors that in the E-Class Saloon, but with the addition of standard split-folding rear seats. Comand Online with a 12.3-inch screen comes as standard on the E 350 d, and customers can add to this with the 12.3-inch cockpit display for £495. For the first time, the E 220 d Saloon is available with 4MATIC four-wheel drive– it’s priced from £37,730 (£1,500 over the rear-wheel drive 220 d). It accelerates from 0 to 62 mph in 7.5 seconds, and has rear-biased torque distribution of 45:55. All E-Class Estate models are now available with an optional folding bench seat in the boot, for £1,250. This provides an extra rear-facing two Artico-covered seats – which are specifically designed for use by children under 115 cm (3 ft 9 in) in height – and is stored under the load compartment floor when not in use. An Easy-Pack load securing kit can be specified for an additional £295. This provides rails in the load compartment floor with a telescopic bar that means luggage can be safely clamped against the rear seats or side wall. An AMG carbon fibre package is available on both Mercedes-AMG E 43 bodystyles for £1,575 – it includes exterior mirror casings and an AMG spoiler lip (saloon only) finished in carbon fibre. The GLC Coupé is now also available with the V6 3.0-litre diesel, producing 258 hp. 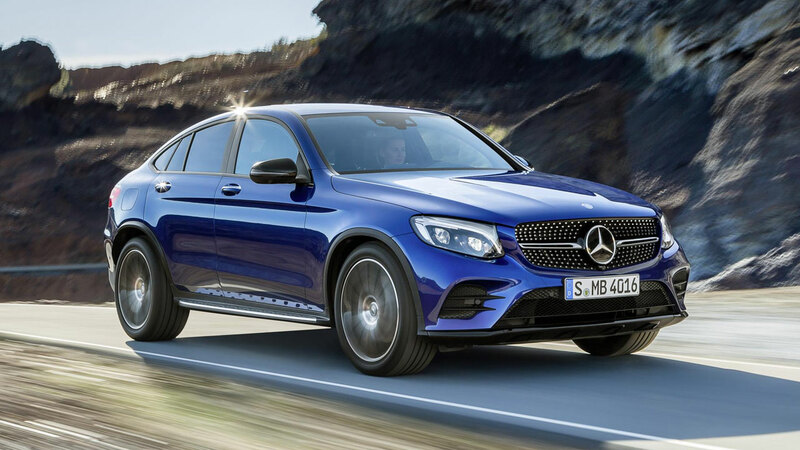 The GLC 350 d 4MATIC Coupé can sprint from 0 to 62 mph in 6.2 seconds, emits 161 g/km of CO2 and delivers up to 47.1 mpg on the combined cycle. It is available from £47,135. 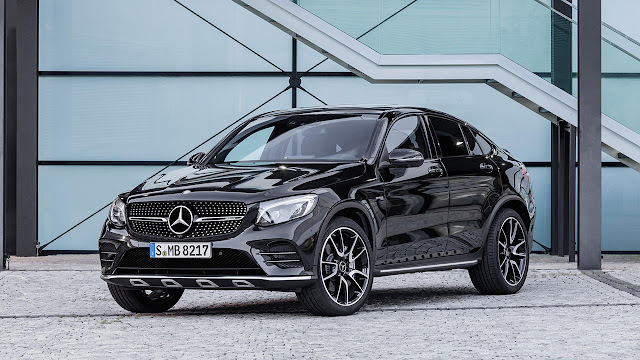 The Mercedes-AMG GLC 43 4MATIC Coupé can now be ordered from £50,960. Its bi-turbo 3.0-litre V6 petrol engine produces 367 hp, making for 0-62 mph in 4.9 seconds and an electronically limited top speed of 155 mph.